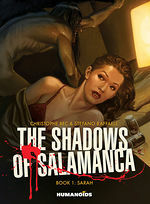 Omnibus edition includes all 3 books of the series. 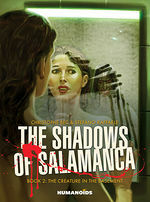 This spine-chilling and multi-layered horror story contains more than one monster lurking in the shadows! Sarah and David, a young married couple from New York City, arrive to settle near Salamanca, a small Pennsylvania forest village whose unwelcoming inhabitants appear to be protecting a secret and troubled past. Prey to her own childhood demons, as well as chronic anxiety attacks, Sarah discovers that this new life, which was supposed to bring about a fresh start, actually only drastically increases her foreboding. In order to confront her fears, Sarah searches for a truth that will lead her to places where human and supernatural horror arise without warning, quickly and violently. 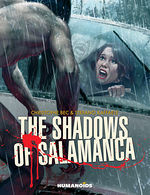 "Anyone who enjoys a creepy horror story based in the real world, but with anomalous elements creeping in can’t go wrong with The Shadows of Salamanca. 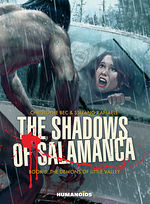 Almost every page is sheer quality, and it’s a story you’ll be able to re-read and enjoy just as much"
A story I found effectively horrifying, all the more so because the art is so attractive. With scares and bloodshed, this book delivered the goods.